The Russian father and son following their arrest for allegedly selling ecstasy on Fields Avenue in Angeles City. Picture courtesy of the PDEA. 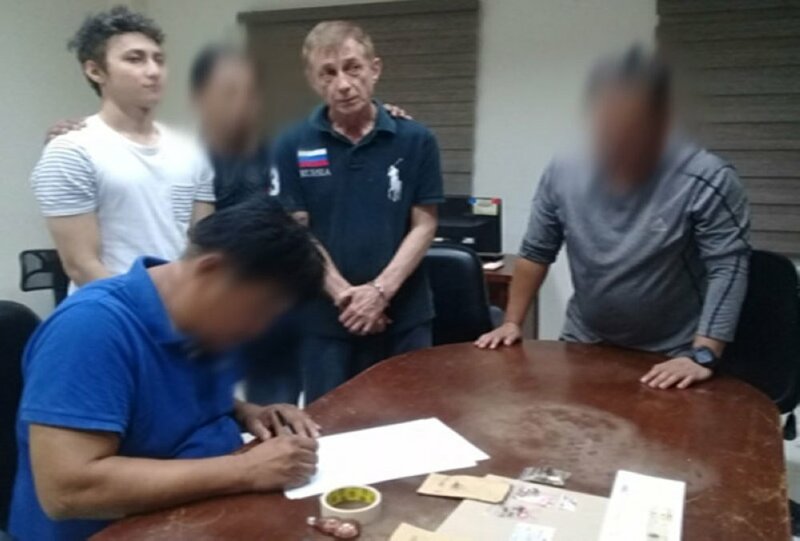 A Russian father and son have been arrested in Angeles City on suspicion of selling ecstasy on Fields Avenue. Joint operatives of the Philippine Drug Enforcement Agency (PDEA) and Intelligence Service of the Armed Forces of the Philippines (ISAF) snared the pair during a raid in Barangay Malabanias on Saturday (June 23). The two men were identified as Vladislav Rozhdestvensky, aged 64, registered as a resident of Santa Monica, California, and Boris Mabonga Rozhdestvensky, 23, a resident of nearby Mabalacat City. Pabilona said the two suspects were arrested after allegedly selling drugs to a police officer who was posing as a buyer during a buy-bust operation in the Fields Avenue red light zone. The father and son are now detained at the PDEA detention facility in Angeles City. They have been charged for violation of Section 5 (sale of dangerous drugs) and section 11 (possession of dangerous drugs) of Republic Act 9165.